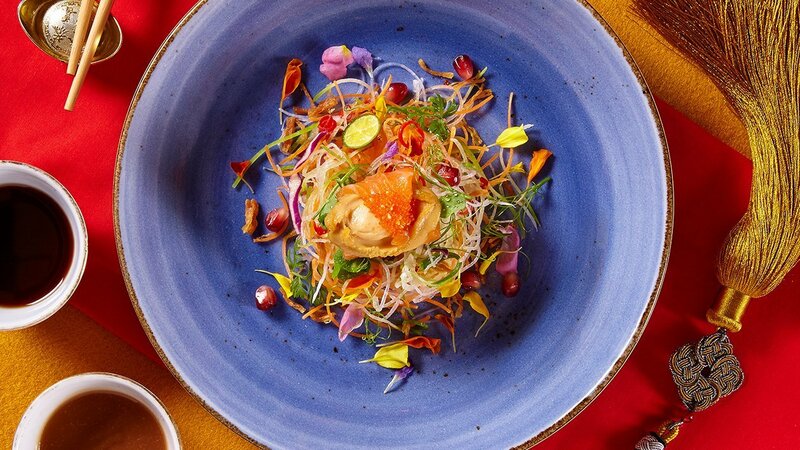 Abalone “Yusheng” symbolises guaranteed success. And this “Yusheng” recipe boasting premium ingredients like abalone and salmon roe coupled with the traditional ones make this a “guaranteed success” for your Chinese New Year service. Mix well the seasonings and set aside. Place the smoked salmon slices and abalone strips on separate small round plates. Prepare a big plate, place the white radish, carrot and green radish in the centre. Lay the rest of ingredients Ain the mentioned order in circles round the plate. Sprinkle sesame seeds and ground peanuts, squeeze lime juice onto fish slices, place the abalone and fish slices on the radish. Sprinkle pepper, drizzle seasonings and scallion oil, lastly scatter dried scallops. After placing all the ingredients, you may start to toss the “Yu Sheng”.